Dave Splash Dot Com: Is Bush Back On The Sauce? Is Bush Back On The Sauce? Well, not exactly. This picture of the commander guy was taken at the G8 Summit while he was meeting with the German chancellor (the same one he creeped out by trying to give a back massage to last year). Americablog has confirmed he is drinking "near beer" and not actual beer. Still, the "near" stuff has 1/6 of the alcohol of regular beer. Should an alcoholic be drinking the stuff at all? Shouldn't someone in the media look into this? 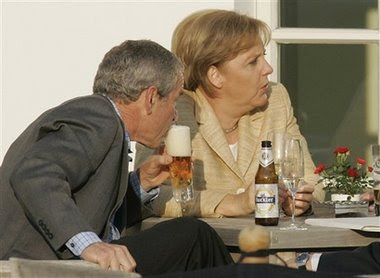 Now it is reported that Bush has missed some meetings at the G8 due to an "upset stomach." Maybe this is just the tip of the iceberg and he is really hungover. It's worth a look. UPDATE: A good friend of mine, who is a member of AA, said that for alcoholics near beer "is not suggested." That's about as definitive as I can get. That "near beer" sure has a fuzz! Does near beer even taste like a good beer?